One-piece bone shelf nut for you to finish and install on your guitar! See it fitted and installed on a guitar! Tool to pre-test offset lengths! Time for a new, faster Roku? This topic is specifically directed at DIY-ers; luthiers know what they need and already have the tools. Though professional tools can greatly improve your speed, and perhaps the resulting quality, they are by no means essential. For instance, you would expect a professional luthier to have a good set of nut slot files, but that may be too expensive for an owner of one or two guitars. You can do the job, if you are careful, with a set of mini needle files from a local hardware or a luthier supply. keep in mind, though, that, in the case of the nut slot files, there is a huge difference in the ease and accuracy of the real thing vs the substitutes. There is more than one way to do most setup processes, even among professionals, so use your imagination to find a good way to accomplish what you need to do. After accurately tuning the selected string while fretting behind fret 2, release your finger and then measure the cents-off-pitch of the open string. Then multiply the number of cents off by an amount related to your scale length below. It's as easy as that! for 24.875" scale is .01436"
for any other scale length, multiply the 25.5" compensation amount by your scale length divided by 25.5". Example: 25.5" scale, open Low E is 6¢ flat. Compensation amount is 6 x .01472 = .08832", round to .088" of compensation of the nut toward the first fret. Note: As the cents-off increases, the compensation amount per cent decreases, as does the width between frets as you go up the fretboard, however, the decrease is so tiny for the first 10 or 15 cents of the first fret, the difference can be ignored. Note: Please stand by for a little more detail and exposition of the logic behind this topic. Here is a simple tool that you can make! With it, you can do a temporary string compensation, and then, somewhat accurately, measure the offset. It took me about 10 minutes to make this tool from a regular paper clip! To use it, find a gauge of the right thickness, that will allow you to slide the tool under a string, almost to the nut, putting just a tiny bit of upward pressure on the string. Then, using your strobe tuner or program, slide the tool to where the open string is in tune with the 2nd or 3rd fret. Then measure the distance from the nut to the approximate centerline of the tool wire. Since this is an estimate, add a little more length, so you won't come up short. With this information, you can do most of your offset filing prior to installing the shelf nut on the guitar. Buzz got you baffled? You can find which frets are buzzing with your volt-ohmmeter. Set in resistance mode, connect one probe to the test string between the nut and the tuning machine. Hold the other probe on the end of a suspect fret, and pick the string firmly. The VOM will register Open Line for no buzz, less resistance for a bad buzz, and more resistance for a weak buzz. My pocket-sized digital multimeter works really well for this, but here’s an inexpensive tool that’s a little more specialized, from Schrammguitars.Com. When making a partial shelf nut, I need to file back the nut a little for the stings that are already over-compensated. In order to keep the top front of the nut as vertical as possible, rather than file a sloped surface, I use a small Dremel grinding stone to make a hollow grind. You probably notice that my shelf nuts have a smoother, continuous appearance, especially compared to Delft's. That's partly because the cut-backs don't show up well in the (not so sharp) photos. 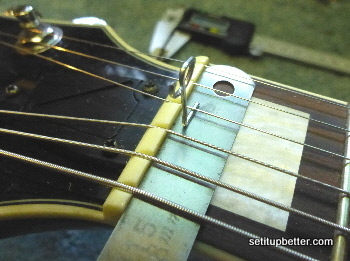 If you are making a new nut, it's a good time to consider string spacing. The most common recommendation for string spacing on steel-stringed guitars is equal distance between the strings. That would give you more distance, center to center, the thicker the strings. I prefer to space the strings equal distance center-to-center. This is a matter of personal preference, so I'll just give my reasons for my preference. My practical reason is that I like to cover two bass strings with one finger, such as an Em 022000 chord fretted by the first or second finger, leaving the third and forth fingers available to play notes on the higher strings. I was not able to do that on a classic style guitar with equal distance between strings. I also like adequate space between the treble strings. I would think that players with fat fingers would prefer equal center-to-center spacing. Hey! New here? Check out how this site is different!